Perusing the aisles at Barnes or my local library, there's quite a range of kids books. Some add new forms of naughty to my kids' bulging bag of tricks. Some are snoozers. Some have no direction. But once in a while, I find a book that's remarkable on multiple levels...fantastic artwork, beautiful wording, humor, positive lessons. 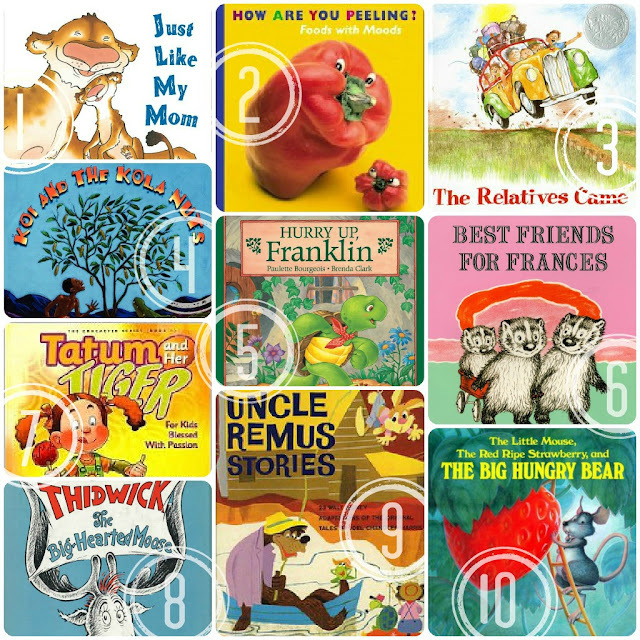 For the grown-up wanting to share something wonderful with a child, here are ten of my favorite books and a bit about them. This is the one I discovered for the baby shower and the artwork on every page is as expressive as the cover. Downright lovey. It's humorous - poking fun at how drowsy we mommies can be first thing in the morning, which is precisely the mix of tongue-in-cheek and heartwarming I love. This book explores and names emotions. It was so popular with my toddler twins, I hid it a while because I couldn't take the fighting. The photos are vivid and the message is, Feelings are okay. I've come to see them as signs our bodies give us, much like symptoms, that clue us in to our soul's condition. They're a huge part of their experience, so I want my kids to learn about them. This is a young child's experience of a visit from relatives who live far away. My favorite line from the book is, "We were so busy hugging and eating and breathing together." It captures the simple joy of being near people you love. I'm not proud of it, but sometimes I have trouble relating to folk tales from cultures very different from my own. This story values acting mercifully rather than selfishly, even when life seems unfair. And the onamonapia is breathtaking. This book had me thinking it was your run-of-the-mill kid struggles with said temptation and because he gave into it, this negative consequence happened. Little Franklin is dawdling all through the book and you feel failure looming. But then he catches himself, changes what he's doing and gets the result he wanted. Inside myself I whooped, "And that's how it's done!" At last, an author who thought a positive example would go the distance, and left fear tactics in the dust. This book deftly tackles the leaving-people-out challenge. You can count on Frances to be honest about how she feels even if it's not terribly tactful, but her sass is partly why I like her so well. Meant to be the first in a series of books about traits children are born with, this one focuses on passion. It speaks positively about a characteristic that could be construed negatively. Seeing our traits as gifts means we can harness our energy and propels us toward the abundant life God has for us. The artwork is gorgeous and unique, mimicking the depth of field of a camera. I enjoyed this book in my childhood. It's pricey because it's no longer in print and rare, but it's a collection of several stories told in the dialect spoken by negroes in the south and southwest. It's rich. I'll never forget my mom reading it to my sisters and me. I love this book. My scrutiny may be impaired by the fact that it was the first book my son learned the words to. He'd tell it to himself in baby words when I wasn't reading it to him. For some reason, it always makes me smile. Hope you found something new to enjoy and I'd love to know what your favorites are! P.S. Just so you know, I get a small commission if you follow these links to buy the book. Glad you found some new ones. Enjoy! Some of my favorites are by Robert Munsch who is a Canadian author and you can't find any of his books in US stores except for his very famous "I Love you Forever" book with the baby unrolling toilet paper in the bathroom on the cover. His other books are pure imagination. "50 Below zero" is about a sleep-walking dad and a son who has to get up and put his dad back to bed over and over. Then there is the "Paper Bag Princess", and one about markers and how a little girl is obsessed with drawing with every kind of marker. Anyway, you should look him up on Amazon.